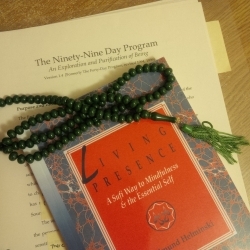 An introduction to Sufism and spiritual psychology, developed by Shaikh Kabir Helminski in the form of a 99 Day Program, providing a structure for spiritual practice through study, awareness activities, and correspondence with a mentor. The Ninety-Nine Day Program is available as a PDF download, or as a three-ring binder. So far, more than one thousand people have worked with this program and it is being periodically refined. The Ninety-Nine Day Program seems to be answering a real need. It has been used by a political prisoner under the harsh conditions of solitary confinement, by a Catholic nun in a Third World country, by people who have lived up to twenty-five years with the Work, by Buddhist monks, and by people with no formal spiritual training, all with positive results. Click here to read responses from past participants of the 99 Day Program.